Statutory research is a significant piece of your research on any legal issue. While your law classes are mostly case-centered, in the real world, after secondary materials, statutes are one of the first resources you should turn to when you conduct legal research, whether at the federal or state level. This is because most areas of federal and state law are governed by statutes, and their corresponding regulations. A court may be called on to interpret a provision in a statute that is unclear, but the case law in that instance revolves around the statute and its meaning. Once you have found a relevant code section, read it carefully. Also read any official notes that follow the section; these are considered part of the law, too, and they may offer helpful interpretation. Finally, if you are using an annotated code that contains editorial research aids, it is important to review any references to related regulations, cases and other secondary sources. Whenever you do any kind of legal research, whether with paper resources or online, you should always think about how you will update your research. Hard copy statutory codes contain pocket parts in each volume, and sometimes separate softbound supplements, to update the information in the bound volumes with recent legislation, new code sections, and recent case law. These are usually replaced once every year. Make sure to always check the pocket parts! In addition, there are often monthly or bimonthly supplements, usually at the end of the code set, with updated code sections and case law (advance code services) and with very recent legislation (advance legislative services). Don=t forget to check these updates, too. If you are beginning a research project on a new topic, you should familiarize yourself with the topic by reviewing legal encyclopedias, law review articles and other secondary resources. This will give you an overview of your topic. In addition, you may also find references to relevant statutes that govern aspects of the issue. Note any statutory citations that appear to be relevant to your issue and find them in the statutory code that governs your jurisdiction. The United States Code (USC) codifies statutes at the federal level; at the state level, Oregon Revised Statutes, for example, codifies Oregon=s statutes. Find the code's subject index, usually at the end of the set in several softbound volumes. Look up words that express the concept you are researching. You may have to brainstorm to come up with various synonyms and other alternate terms. The index may refer you to another term, so follow the trail. When you find an entry that seems to cover your topic, note its citation to the title, chapter or topical code and the code section. The entry may send you to more than one code section, so note any that appear to be relevant. Find these code sections in the code volume that contains your title, chapter or topical code and the section number. 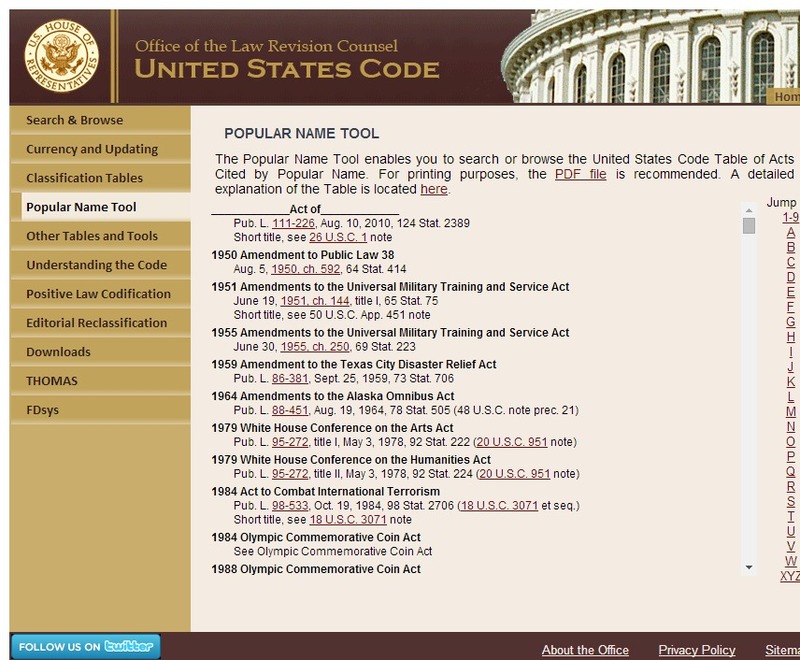 If you know the popular name of a legislative act, for example, the Americans with Disabilities Act, you may find the statutory code citations for this act by beginning your research with the Popular Names Table, found in the U.S. Code and in most state codes. The Popular Names Table is usually found in the index volumes, or in other supplementary tables volumes near the index. If your act is included, it will refer you to the title, chapter or topical code and the section numbers where the act resides in the code. Remember that the various sections of a legislative act may be separated and placed in different titles of a code; it does not always fall together in the code under only one title or chapter as a unified scheme. Find these code sections in the paper version of the code volume that contains your title, chapter or topical code and the section number. If you have a citation to a known statute, it is easy to retrieve the text of that statute (or regulation, or case) by entering its citation into the LexisNexis (Get a Document) or Westlaw (Find) retrieval box on most of their screens. You may review any editorial annotations online, as well. If you are viewing other online material, such as a case, which refers to a statute, you will be able to click through to that statute from the original document. Just remember that this is incomplete research. You should look for other relevant statutes in the code=s online or paper subject index, as outlined above. If you don=t have a citation to a known statute, it is perilous to search for statutes online by keyword, unless you have a relatively unique keyword, such as Akrypton. @ And even then, a legislature may choose another term to define that concept. You should begin any online statutory research with an online code index, just as you would with the books. Westlaw has federal and state statutory code indexes, each as separate databases. LexisNexis does not offer statutory indexes, so if you do not have access to Westlaw, use a paper code index. Among the research aids you will find in the annotated federal codes, and many annotated state codes, are references to regulations promulgated by the executive branch agencies, to fully implement the corresponding statutes. Statutory language is somewhat general, by its nature, and it is up to the agencies to promulgate regulations, to establish in more detail how the law applies to members of the public. In USCA and USCS, you may find citations to regulations published in the official Code of Federal Regulations (CFR). In state codes, you may find references to regulations in state administrative codes, such as the Code of Maryland Regulations. Note the citations to any regulations that are listed and find them in the paper administrative code or on LexisNexis or Westlaw. In the research aids, you will also find abstracts, called annotations, to cases that interpret the language in that code section, and possibly the language of a corresponding regulation. Review the case annotations and note the citations to any cases that appear to be relevant. Find these cases in the paper reporters or on LexisNexis or Westlaw.